The famous Royal Albert Bridge which crosses the River Tamar, linking Devon and Cornwall has been featured on a limited edition stamp. 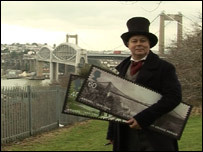 Royal Mail is producing six special stamps to celebrate the 200th anniversary of the birth of engineer Isambard Kingdom Brunel. Brunel was recognised as a pioneer of the industrial age, producing some of the greatest works of Victorian times. The Royal Albert Bridge is pictured on the first class stamp. Others in the collection include Paddington Station, the Clifton Suspension Bridge, and the steam ship the PSS Great Eastern. The special issue comes with a 20-page book detailing Brunel's career, achievements and legacy. The Royal Albert Bridge was the world-famous engineer's last major achievement. It was completed in 1859, the year Brunel died.